In which we attempt to distill its essence. It is difficult to draw up a classification of petroleum waxes that could not be subjected to criticism. 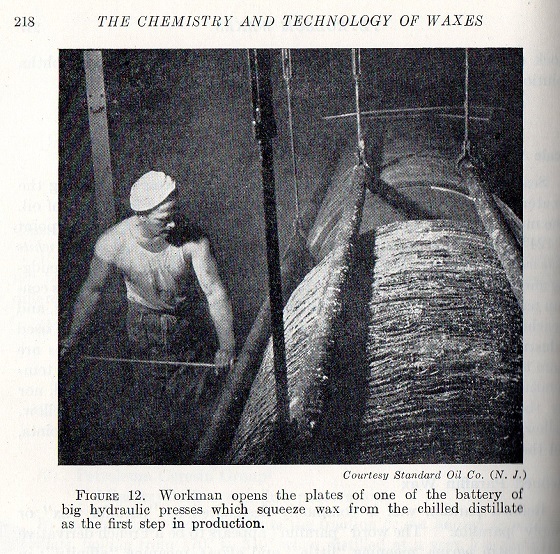 So begins Chapter 5 in The Chemistry and Technology of Waxes, and, hoo boy, some things do not change. Paraffin (petroleum waxes) and criticism still go together. After reading what Warth had to say about paraffin, I read about paraffin online, and for a while I figured any chapter on paraffin would have to be dubbed “Paraffin: That Present-day Deadly Dastardly Villain of the Wax World” and/or “Paraffin: The Pariah of Our Times.” That so many people are so compelled to label paraffin “toxic” reminds me of that story about beeswax and negative ions as well as the story about bayberry candles putting gold in your pocket. Why are people saying these things? Talking about paraffin as one distinct product is like talking about soy wax as one distinct product, or, for that matter, cereal or cheese. There are endless permutations. The term “paraffin” can refer to any of the wax that is found in crude oil, wood, or shale at any stage of refinement. The various classifications, or grades, of paraffin mainly differ in hardness, oil content, and melting point, all of which can be manipulated to steer the end product toward different commercial uses. But also, according to Warth, paraffin’s characteristics differ from the get-go. 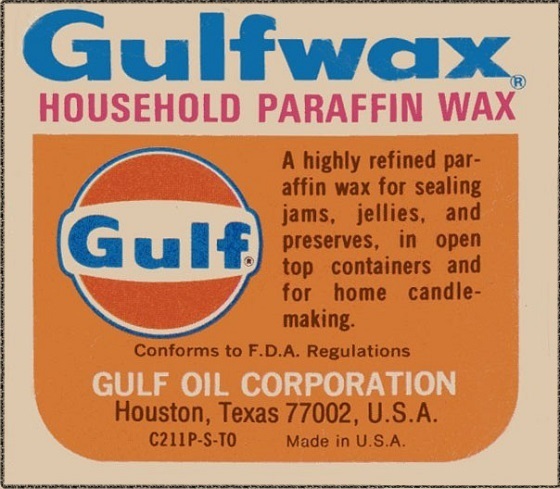 Pennsylvania and Mid-continent oils contain a high percentage of paraffin wax; California oils are almost wax-free. … Differences in the physical characteristics of the paraffin waxes can often be ascribed to the origin of the crude. This is reminiscent of beeswax, as the scent and color of beeswax is directly affected by its origin, specifically by the flora the bees visit. As crude oil is the ancient remains of various organic materials, it makes sense that characteristics can vary by location. a white crystalline substance obtained by distillation from wood and shale, is of a waxy nature so that it is used for waterproofing, and for preserving objects from the action of the atmosphere. The obelisk in Central Park is coated with paraffin. 1. a white or colorless, tasteless, odorless, water-insoluble, solid substance not easily acted upon by reagents, consisting of a mixture of hydrocarbons chiefly of the alkane series, obtained from crude petroleum: used for candles, for forming preservative coatings and seals, for waterproofing paper, etc. That paraffin cannot be “easily acted upon by reagents” speaks to its name, derived from Latin, meaning “little affinity,” or unlike others. A wax distillate containing 80 per cent of oil and 20 per cent of wax is distilled over at 315º to 425º (600º to 800º F). This distillate is chilled and pressed to give: slack wax containing somewhat less than 50 per cent of oil and more than 50 per cent of wax; spindle oils with pour point of plus 6º to 7º (20º F). The slack wax is chilled and sweated to form scale wax which contains 1 to 6 per cent of oil, 99 to 94 per cent of wax, and foots oil, made up of lower melting point wax plus oil. The scale wax is then refined to paraffin waxes of different melting points, leaving a slop oil of little or no value. All this talk of sweating and chilling makes me think of people in saunas during winter—they heat up, sweat, jump in snow, chill out, repeat—but also, again, of beeswax. When beeswax is first scraped off the comb, it contains a percentage of honey. Through successive steam or hot water baths the honey is washed out, leaving behind wax with a lower percentage of honey. When I am processing beeswax—melting it in a pot with a bit of water then straining it through cloth before pouring it into a mold—there is always some “slum gum” left on the cloth as well as on the bottom of the cake of wax that will cool, harden, remain in the pot. Like slop oil, slum gum has little or no value. All things of value—the honey, the beeswax, the pollen and propolis from the beehive; the gasoline, kerosene, diesel (et al. ), and paraffin from the crude oil—have been removed and used. The refining of paraffin can go on and on by various measures and means resulting in several different products used in several different applications, food packaging (such as wax cartons) being the number one product with candles being number two. Paraffin is commonly used in foodstuffs, and New Zealand beekeepers have been to know to use it to protect their hive boxes from the elements. 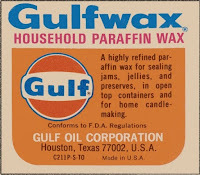 Due to the refining process that oil goes through to get to paraffin and that paraffin then goes through to get to all of its possibilities, I understand why some think paraffin is not a natural wax. But, in my book, it is. It exists down there in the oily depths of our planet (as well as in shale and peat), and maybe we shouldn’t be pulling so much of that stuff up and out of the earth, using it willy-nilly, but we are and have been since the mid-1800s. Even if we try to slow it down and use less oil, less gas, turn to alternative energy sources, which I’m all for, as long as oil is being dredged up, why not use every bit of it? And all this mixes with your most mystic mood; so that fact and fancy, half-way meeting, interpenetrate, and form one seamless whole. The Spruce Eats: What is Paraffin Wax?